Duty Driven 45KN / 10,000 lb Real Steel Carabiner. Screw gate, 45Kn Minimum Breaking Strength, Meets or exceedsEN362 Standards. Hercules is Good for Rock Climbing, Rappelling, Fall Safety and More. Locking carabiner for fall protection, rappelling, rigging and rope work where Herculean strength is needed. You can tell when you hold this meaty carabiner in your hands that is is strong, solid steel, and it is as mighty as the legends would have you believe. At 260g of cold formed steel, just one of Hercules steel carabiners in your hand is enough to make you feel immortal! All the strength you need for rock climbing, belaying, rappelling and rigging is right here. ISO 9001 and CE certified manufacturer, this product meets or exceeds EN362-2004 and ANSI Z359.12:2009 standards. NEW AND IMPROVED! You spoke, we listened - now stamped with the weight rating to ensure you are getting what you need! 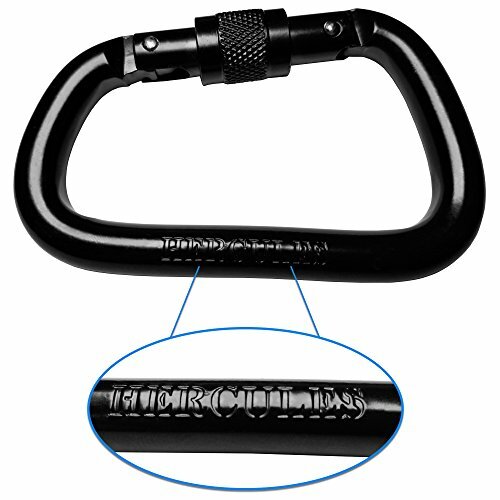 Cold Formed Steel Carabiner, Capable of Handling Massive Loads up to 10,000 lbs, or 45kn of Herculean Strength. This carabiner can take whatever you can dish out. Meets or exceeds EN362-2004; ANSI Z359.12:2009 standards. ISO 9001 and CE certified manufacturer, designed in the USA. .94 inch (24mm) gate clearance fits rope up to 1 inch diameter. You're gonna love this highly capable, durable, beautiful piece of equipment. More performance than you need, at a price you can afford (finally), add this to your collection as soon as you can click BUY NOW! View More In Carabiners & Quickdraws. If you have any questions about this product by Duty Driven, contact us by completing and submitting the form below. If you are looking for a specif part number, please include it with your message.